VIPSEAL On-Road colour is Blue. This has been specially designed for vehicles that travel on-road and at high speed (over 80kmph). It has been tested for use at speeds up to 240kmph. 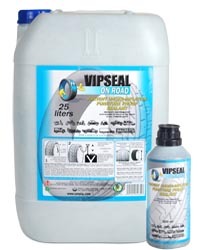 VIPSEAL On-Road is available in 500ml and 1l bottles and in 25l drums. On a 4x4 vehicle, if the owner is driving in a city or on a highway the most appropriate is the use of VIPSEAL On-Road Blue. If you venture to do « Off-Road », you should preferred VIPSEAL Off-Road RED. -	Maintains air pressure (5 to 10 times longer) and increase the tyre’s lifespan (20% to 50%). -	Besides fuel economy consumption by 3% to 10%, increase the tyre life by 20% to 50%, VIPSEAL protect you 100% on punctures by objects that don’t get stuck in the treads. - Note that VIPSEAL protects and guarantees your tyre on the tread area in case of puncture caused by an object whose diameter is up to 6mm for vehicles of less than 3.5 tons and 12mm for vehicles over 3.5 tons. - Centrifugal wheel balance at more than 40kmph and active during the whole lifespan of the tyre. No more need of a classical static balance. - VIPSEAL contributes to sustainable development and environmental protection in the use as well for the manufacturing process. -	VIPSEAL is water-soluble, non-corrosive, non-flammable, non-toxic and fibre-free product. -	VIPSEAL is reliable for the entire lifespan of the tyre and rim, it protects them from bacteria, mould, corrosion and rust. -	VIPSEAL is water-washable and does not alter the tyre and rim. -	VIPSEAL withstands extreme temperatures from -35°C to +45°C, making it particularly suitable for driving in countries experiencing severe weather conditions. VIPSEAL does not guarantee against side punctures in tyres. VIPSEAL is a puncture-prevention sealant and is not a curative product. Exemple : for a 250ml domestic car, for a family car 300ml, and for a sedan or commercial vehicle 350 ml. VIPSEAL achieves its optimal effectiveness after 50 km of driving. If the tyre deflates after VIPSEAL is pumped inside, check to see if any objects are penetrating the tyre and remove them all. Re-inflate and rotate the wheel so that the product plugs up the hole(s).